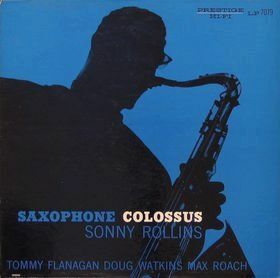 Because I am once again doing this while pressed for time, let’s go with an obvious choice for this week’s selection: Sonny Rollins’s Saxophone Colossus. I assume anybody who would bother clicking on a blog post about a jazz album knows this album, it’s that ubiquitous. But that ubiquity is well-deserved, because there are two tunes on the album that are absolutely brilliant all-time greats, and that’s pretty good for a 5-tune album. The other three tunes are pretty nice as well.